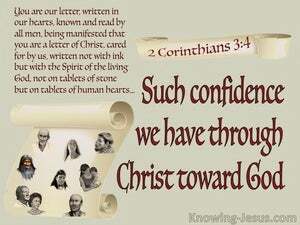 ﻿ 2 Corinthians 3:4 Such confidence we have through Christ toward God. Such is the confidence that we have in God through the Messiah. Such is the reliance and confidence that we have through Christ toward and with reference to God. [We say this] because we have such confidence in God through [our relationship with] Christ. It is by Christ that I have this confidence in God. Such is the confidence that I have through Christ in my relations to God. Such trust have we in God through Christ. 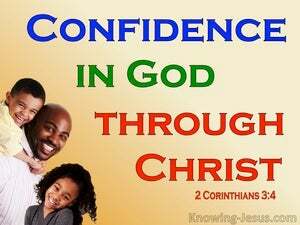 Now we possess such confidence through Christ toward God. Such confidence I have through Christ before God. Now we have such confidence in God through Christ. But, such confidence as this, have we, through the Christ, towards God. This, then, is the confidence in regard to God that we have gained through the Christ. And such trust we have through Christ toward God. Such is the confidence I have through Christ in the presence of God.